Westconnex breaks records in community opposition and secrecy. Posted March 9, 2016 by Christopher Harris & filed under City News. More than 13,000 people made submissions to its New M5 EIS project, the most submissions that the NSW Planning and Environment Department has ever received for an infrastructure project. While Councils and residents opposed to the project struggled to digest and respond to an 8000 page EIS over their summer holidays, the NSW Department of Planning has taken more than five weeks to simply count and publish their submissions. No one has received a letter telling them their submission has been received and not a single submission from a NSW public department, local Council, community organisation or citizen has yet been published, as promised on the Planning website. More staff have been hired to assess the New M5 project, which is a tunnel from Kingsgrove in Sydney’s South West, emerging in St Peters at Sydney Park. But this shouldn’t lead to optimism about the possibility of the Department refusing approval. A construction manager for the Leightons, which is part of the consortium that has already been awarded a $1.5 billion contract to build project, told residents at an EIS session that the company expects approval around April 23. But the submission record is not the only record broken by WestConnex. It is also the largest infrastructure project in the Southern hemisphere at a cost of $16.8 billion, which is escalating at $2 billion a year as more limbs are added to its network of tunnels and massive road interchanges. It is also setting records for lack of transparency and secrecy. Since last October when the Baird government turned WestConnex over to a publicly owned private company called Sydney Motorway Corporation (SMC),WestConnex has not been required to publish its contracts on the NSW tender database. Accounting for public funds by publishing government contracts has been a key component of public administration since the 19th century. This week, NSW parliament will debate Labor’s Shadow Minister for Roads Jodi McKay’s amendment to NSW’s freedom of information act, the Government Information Public Access Act, which would bring the SMC back within the Act. If McKay’s move was successful, SMC contracts would be required to publish its contracts and also would be subject to FOI requests. “Its (SMC)structure is designed to frustrate attempts by the Parliament, the press, ordinary members of the public and other interested parties to hold the Government to account with regard to this enormous public project, ” she said. Labor and the Greens will support McKay’s bill but it will be opposed by the Baird government and is therefore very unlikely to become law. Despite its glossy brochures and graphics, the WestConnex is shrouded in secrecy that flows from commercial confidentiality arrangements concealing the salaries and financial interests of Sydney Motorway Corporation executives and agreements with its major contractors, the biggest of which is Leightons, which is part of the consortia awarded the M4 widening, M4 East and New M5 contracts. If SMC remains outside the GIPA Act, the public will never be able to find out whether engineering company and traffic modeller AECOM, which already had contracts worth $32.7 million across all stages of WestConnex, had been paid even more to work on further stages of the project; or whether corporate legal firm Ashurst ,which has been responsible for drawing up some of the secret WestConnex legal agreements has received more contracts than those already published worth $14.5 million. Despite the massive amount of public expenditure allocated to WestConnex, City Hub has reported on many examples of where planning processes are being rushed and unsafe practices used. .
For example, in digging into M4 East planning documents this week, we noticed that a so far unreported air quality review of the M4 East EIS was only completed one day before the Minister Rob Stokes granted his approval for the project. Although the review supported the tunnel, its authors made many negative comments about the air quality study. It also emphasised that the air quality results are dependent on AECOM’s traffic modelling that has been criticised by a number of independent experts, none of whom received adequate responses during the assessment process. Disturbed by the way their own experts have been pushed aside, local councils have been trying to exercise their own powers to defend communities badly impacted by the WestConnex. In response, NSW Roads and Maritime Services (RMS) is flexing its muscles. The most recent example occurred this week in Terry Street Tempe in Sydney’s Inner West. As residents were getting ready for work on Monday, there were knocks on the door. On their doorsteps were WestConnex contractors who delivered the unwelcome news that residents’ parking spaces would be occupied by a drilling rig for the next week or so. Residents had been told earlier in the year that WestConnex would be drilling in the area in advance of receiving government approval for a new M5 tunnel. But then they heard that Marrickville Council had rescinded drilling approval after a drill occupation on Tempe parkland. After many calls, residents discovered that the powerful RMS, which is commissioning WestConnex, had simply bypassed that Council approval process and invoked state powers for road work. By mid-morning residents and activists protested by occupying the road, which meant the contractors brought in much larger barriers. The contractors then adopted the unusual tactic of enclosing the residents in a fenced off section of the road so that police could order them to move on as ‘trespassers’ in what had begun the morning as their own local road. The protestors were back on Tuesday but so were the contractors with more security guards that are standing watch over the drilling compound. 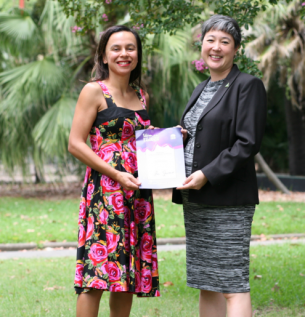 This week, Newtown MP Greens Jenny Leong nominated Lockie who is losing her St Peters home to WestConnex as Newtown Woman of the Year in recognition of her broad-based campaigning along the 33 kilometre route of the WestConnex. Although it is pushing ahead at a frantic pace, the Baird government still lacks funding to complete the M4 and New M5 tunnels. This week, the government reminded drivers that tolls would go back on the M4 between Parramatta and Homebush next year. The government is also seeking more finance from banks. There is no funding in place at all for the third stage a tunnel links the M4 and the new M5. But this has not stopped WestConnex launching an application for planning approval. The application included two more huge tollway interchanges. There are likely to be more forced acquisitions adding to the hundreds of homes already taken by WestConnex. So while a new wave of communities mobilise against the project, the government planners continue to tick their boxes and corporate lawyers and engineers work quietly on their secret contracts. We know [from the public contracts that were published in 2014 and 2015 that both engineers AECOM and corporate lawyers ASHURST were working on the Stage three long before the public had any information at all about the project. What we won’t know unless the SMC is made subject to the GIPA act or there is an inquiry, how many more public dollars they will be earning for their work on WestConnex. Wendy Bacon has attended WestConnex Action Group protests an is an editor of the People’s M4 EIS.